Gyudon（牛丼）is a popular dish which was made even more popular by chains like Yoshinoya, Tsukiya and Matsuya, which make delicious Gyudon for very reasonable prices in Japan. 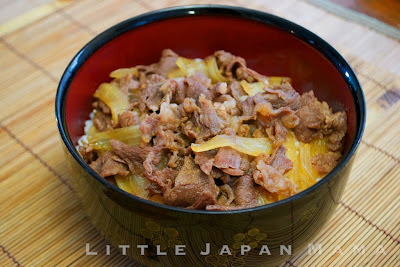 Gyu牛 means beef and don丼 means rice bowl (with something on top). In other words, Beef Rice Bowl. Basic gyudon may be topped with beni-shoga (pickled ginger), sliced negi (shallots/spring onion) and is also delicious as Tsukimi Gyudon（月見牛丼）(with a raw egg on top) if you're feeling adventurous. Steamed Rice and Beni-shoga, to serve. 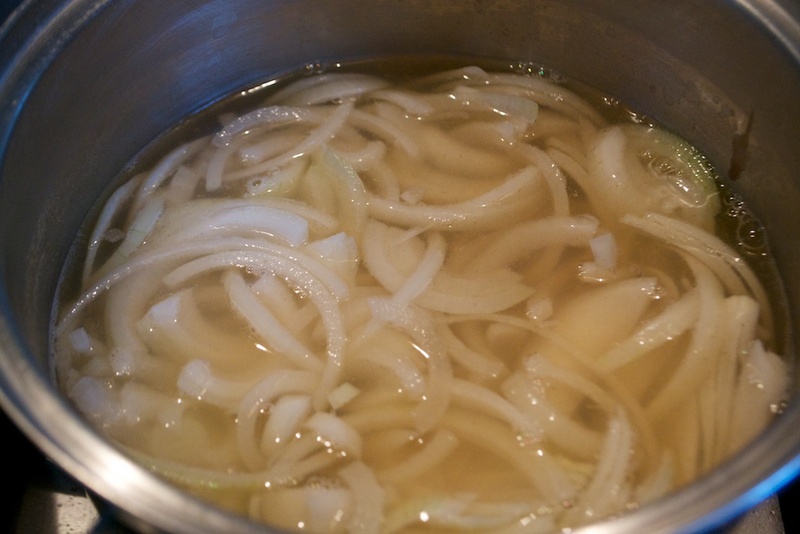 Place water, dashi powder and onions in a saucepan and boil 3 min. 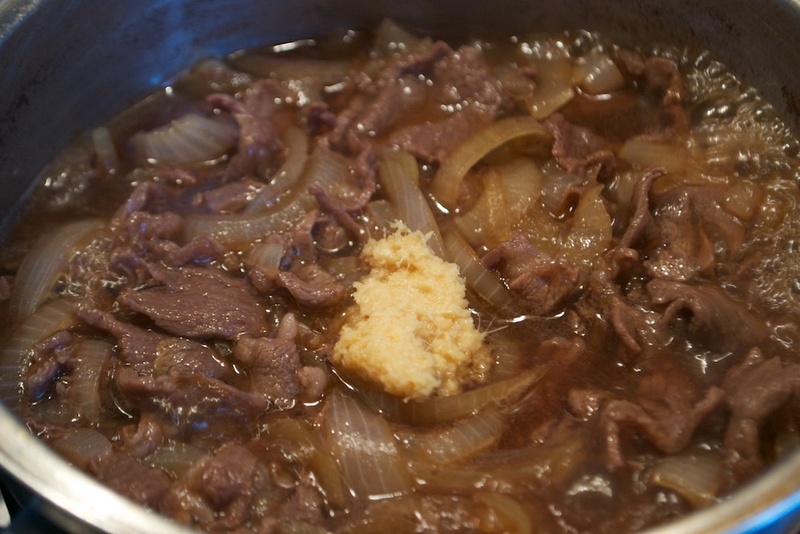 Add sugar, sake, soy sauce, beef, and stir to combine well. Bring to the boil and simmer 10min. Stir in freshly grated ginger and simmer another 5-10 min until beef has absorbed the flavour, onions are caramelised and liquid is reduced to half. 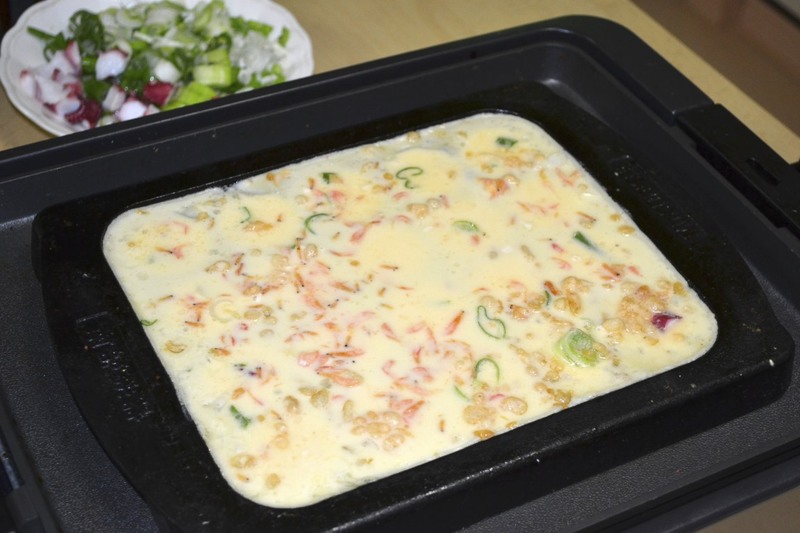 Serve on a bowl of steamed rice and top with beni-shoga if desired. Tsukimi Gyudon: Crack a fresh egg on top for a more adventurous version (my favorite). 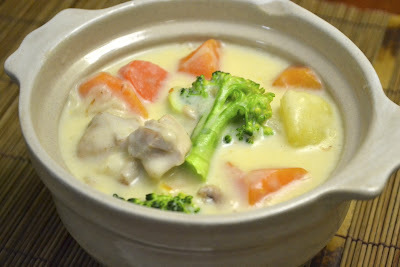 This adds a creamy element to the flavour, similar to sukiyaki. 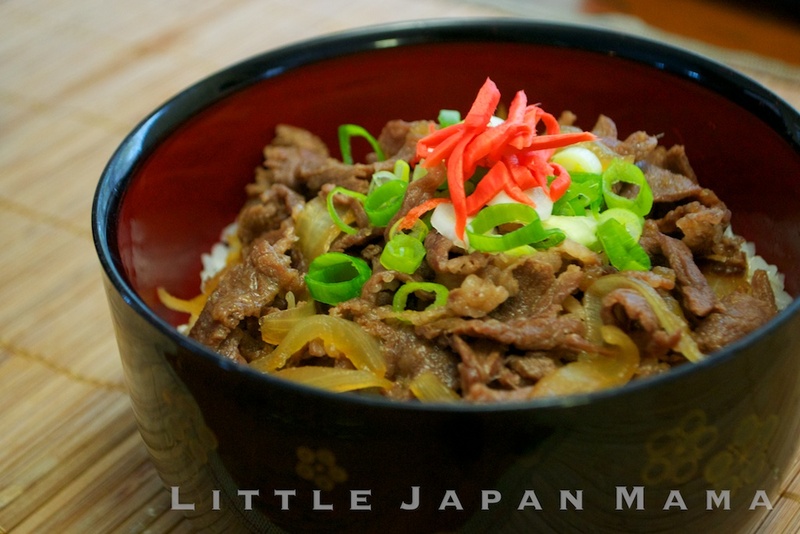 (At step three) One of the keys to perfect gyudon is cooking time. 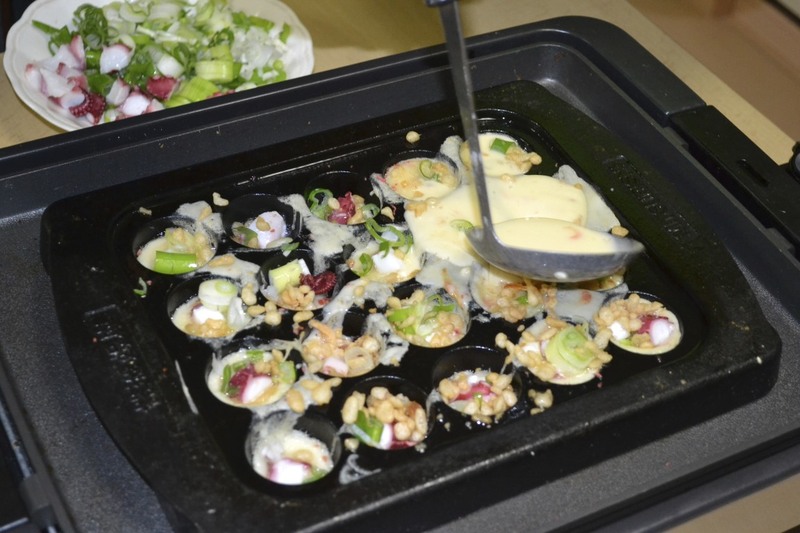 If it is undercooked, the flavour hasn't developed enough and the onions are sharp. 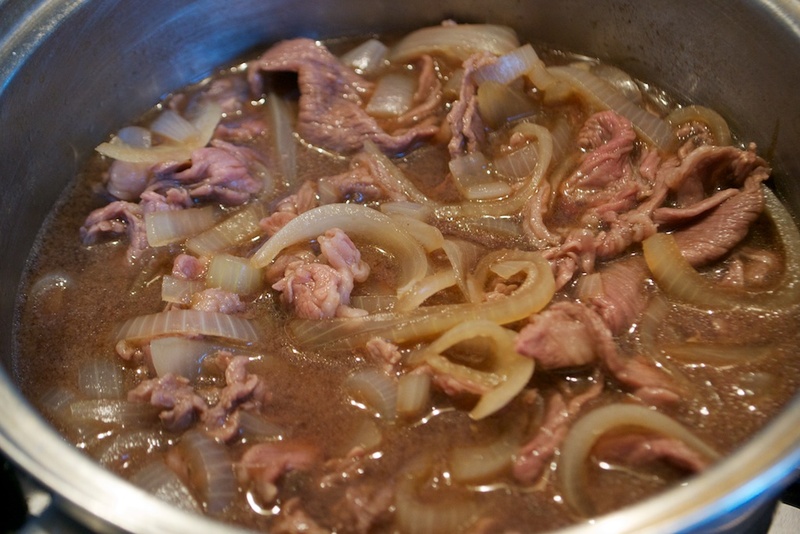 If it is overcooked, the onions will become too soft and the flavour too strong. 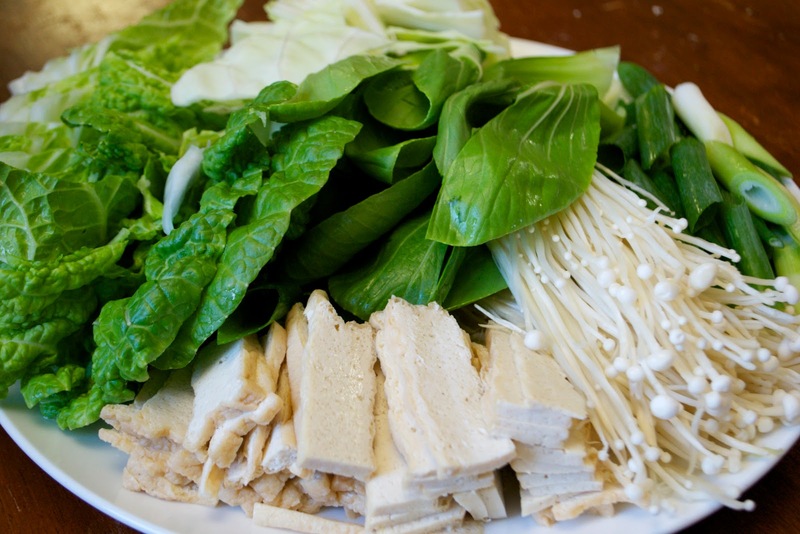 For an Introduction to the Japanese Ingredients you see in this (or any) recipe, click here. Did you read Half Australian Shinobu, Half Japanese Jane (my memoirs on growing up half-Japanese in Australia)? Well, Megumi Nishikura, one of the filmmakers of Hafu Film came across it, and introduced me to something exciting happening in the world of Half-Japanese people. Hafu is a documentary film about the experiences of mixed-Japanese people living in Japan. 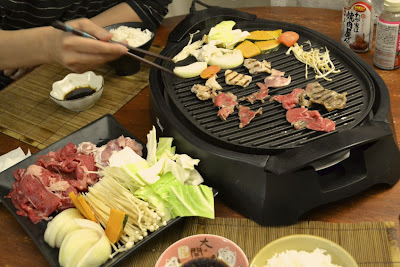 Having never met another half-Japanese (outside my immediate family) until I was an adult, and having no half-Japanese friends in Australia, it was fascinating to read about half-Japanese people who have had similar experiences and feelings to my own. If you'd like to contribute to the making of Hafu Film, there are various thank-you gifts on offer including autographed DVD's of the film, or for very generous donations, having your name in the film credits as associate producer, etc. Have a look here for more information. Images and video in this post are by Hafu Fillm. Are you half-Japanese? What are your thoughts and feelings about being hafu? 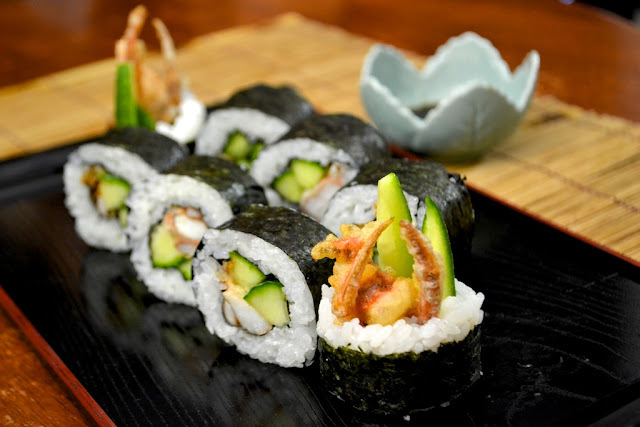 Here is my photo tutorial for how to make Soft Shell Crab Sushi (maki-zushi). I don't make soft-shell crab sushi often, but it was specially requested. 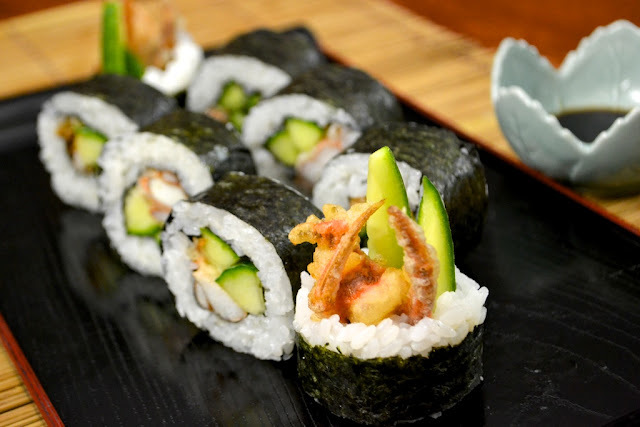 To be honest, I've never eaten soft shell crab in Japan, but it's very popular as sushi (maki-zushi) in Western countries and other Asian countries. 1. 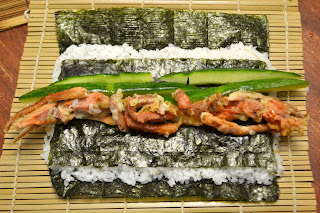 Place the sheet of nori rough-side-up on the bamboo rolling mat. 2. 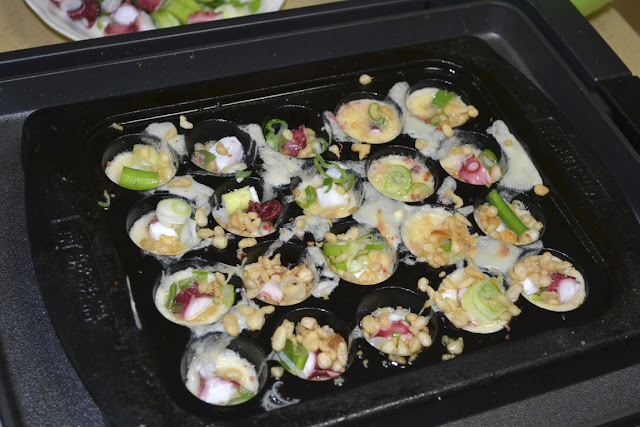 Wet your hands with vinegar-water mixture and grab a handful of prepared sushi rice. Shape the rice into an oblong shape. 3. 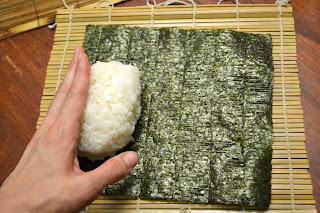 Starting from the left side, push the rice ball across the nori with the (index finger edge) edge of your right hand, spreading the rice thinly and evenly across the nori. Vice versa if you're left handed. Leave a 1.5 inch gap at the far-edge of the nori, and 1/2 inch gap at the near-edge. 4. Place fillings across the centre of the rice. I've used Soft shell crab and cucumber. 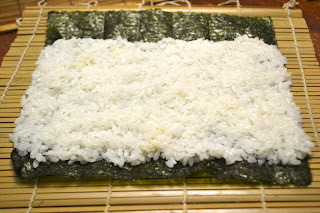 I placed half a sheet of nori over the rice which also makes it easier to roll. This is just another variation. A smear of wasabi goes very well here too. 5. Rolling: My one piece of advice for the novice: Your thumb-action is very important here. 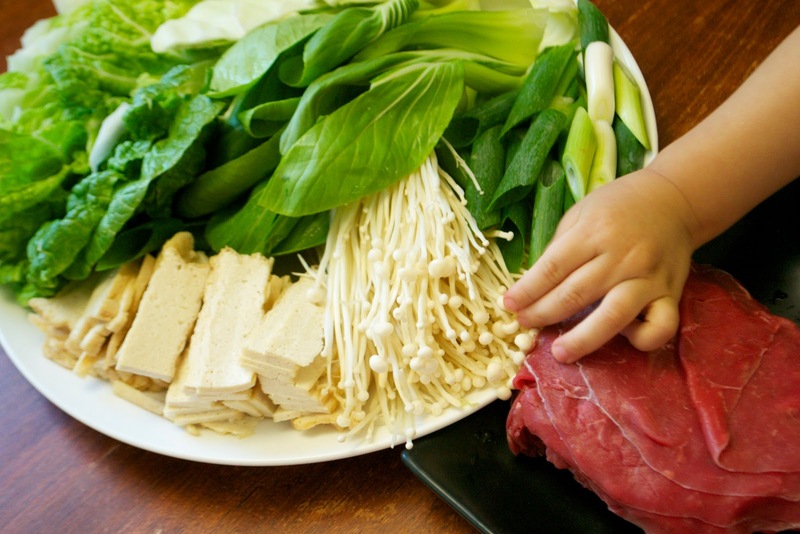 5.2 Pick up the near edge of the bamboo mat and nori with your fingertips. With your fingertips, tuck the near-edge of nori over the fillings, at the same time using your thumbs to bring the sushi mat over the top. 5.3 Continue pushing over with your thumbs while gathering the bamboo mat with your fingers, to roll the sushi into a tight cylinder. 5.4 Now that you have your cylinder of sushi, using the bamboo mat to shape it slightly squarely can make it tighter. 5.5 Slice with a freshly sharpened, wet knife, in a gentle sawing motion. Do you like easy? I definitely like easy when it comes to making dinner. Here are a few of the one-dish-meal recipes posted so far. 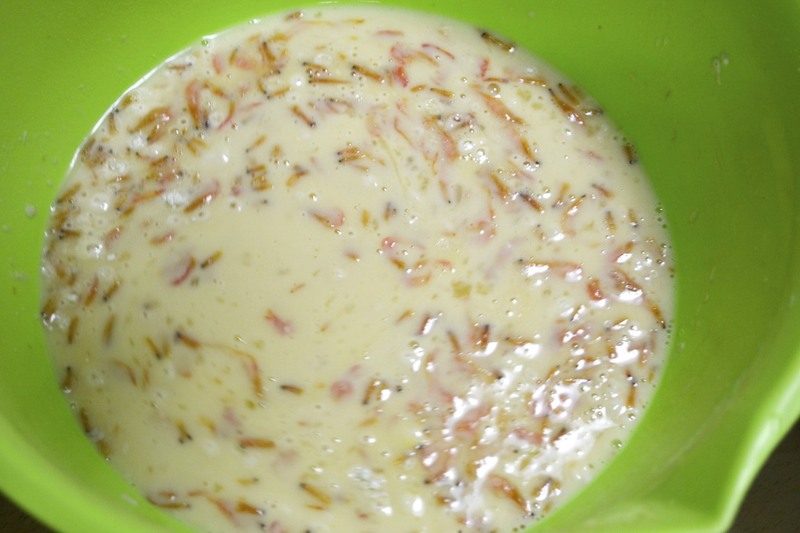 Click on any image to see the recipe. Of the first eleven non-desert recipes that I've posted so far, eight just happen to be one-dish-meals. I think this reflects on my personality and personal preference in cooking - I love doing things the easy way! My mother wasn't interested in making miso soup plus three other dishes for each meal of the day, (maybe that's why she married an Australian?!) and most days, neither am I. 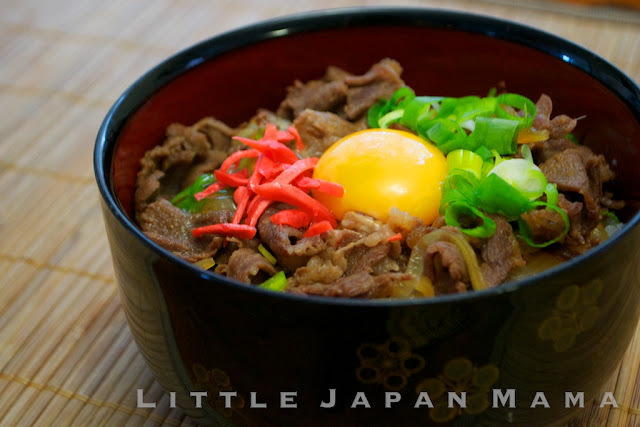 And so you've seen the first few months of Little Japan Mama have often featured one-dish-meals. 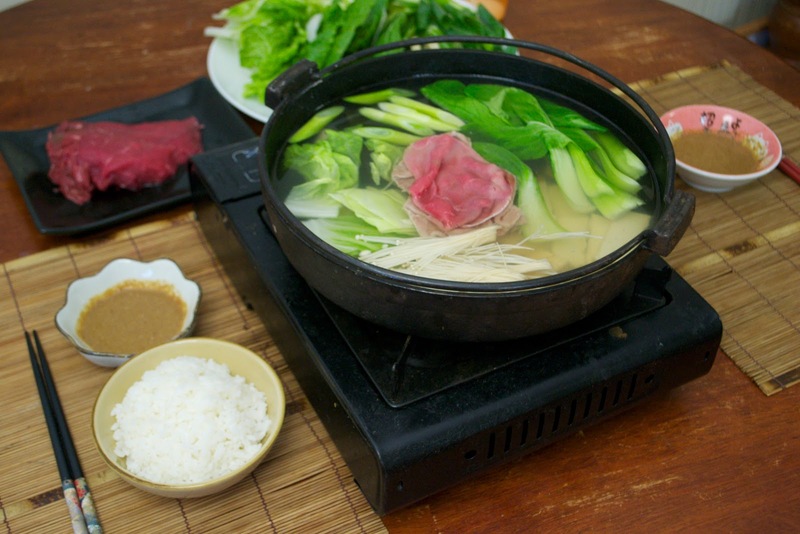 Boil water with Kombu in a wide flat saucepan (or deep frypan). Place on a gas cooker on the table. Add some of each vegetable and tofu, in a separate spot in the pan. 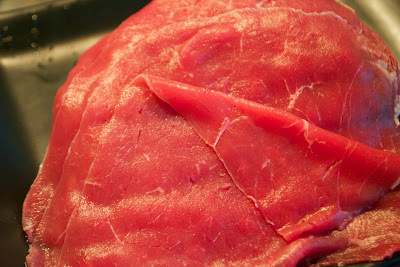 After a minute or two, each person adds meat as desired. Now it's time to eat, ach person dipping each cooked item in the Goma-dare (or Ponzu). While wagyu would be the ultimate meat of choice for shabu-shabu, in our family (in Australia) we enjoy whatever thinly sliced beef we can buy locally. 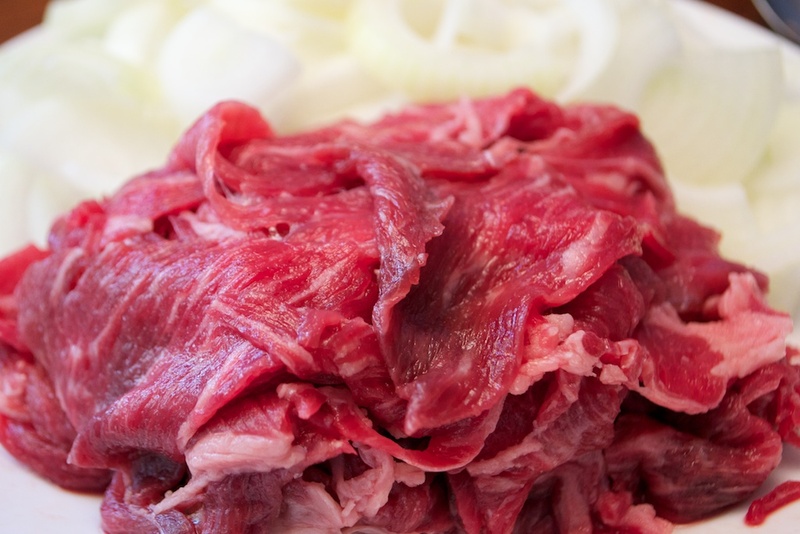 Below is a photo of the "shabu-shabu" beef at a local Korean butcher. It was about $4 for 300g. 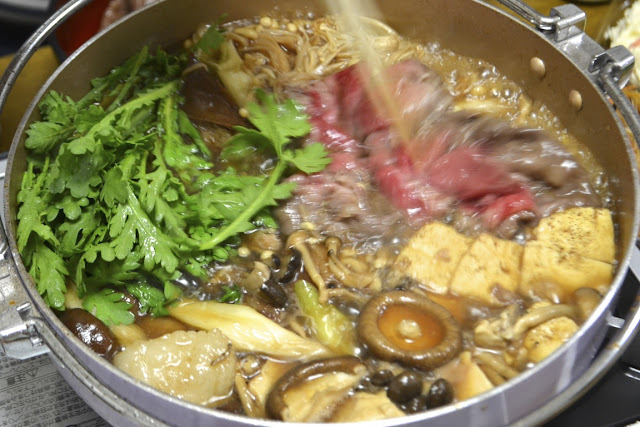 Step 4: Put the kombu in the pot of boiling water and add some vegetables, meat and tofu. ...now all you have to do is enjoy it, because everyone cooks their own. 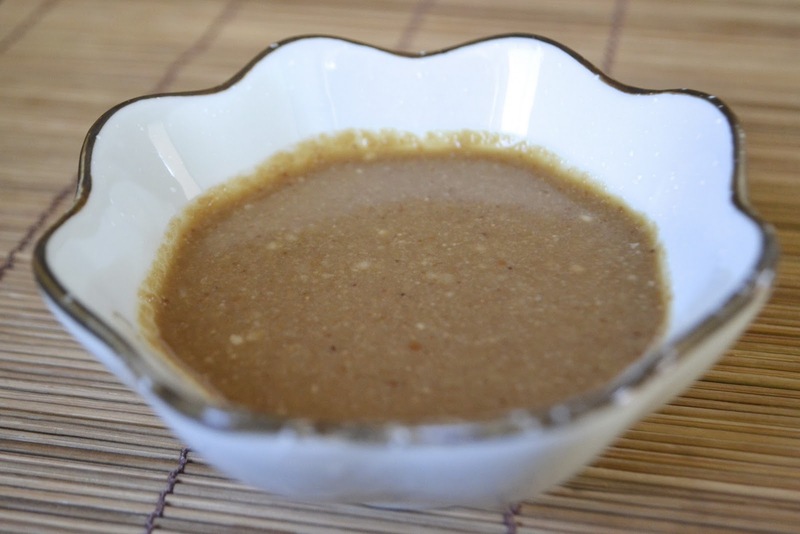 Goma-dare means "Sesame Seed Dipping Sauce". It is the most popular sauce for Shabu-Shabu. 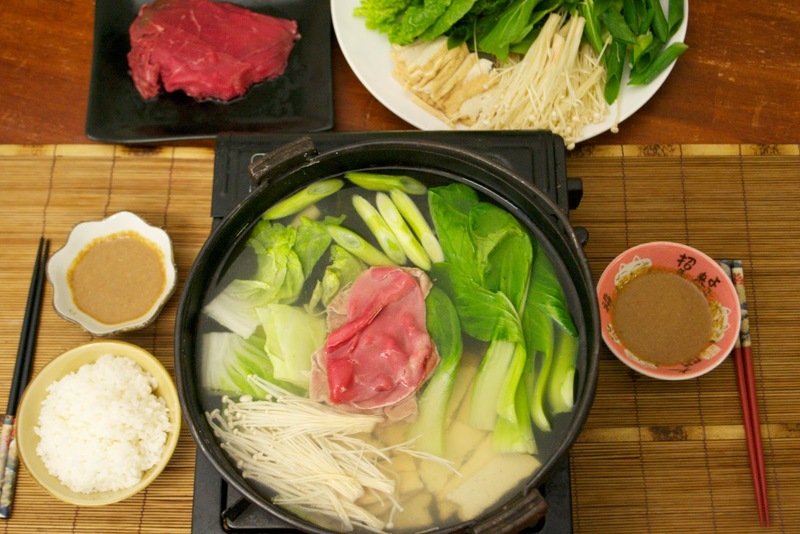 We love shabu-shabu so we go through a lot of Goma-dare. It's too expensive to buy so often in Australia, and home-made has a richer sesame flavour, so I like to make it myself. Place sesame seeds in food processor. Process until ground seeds don't move any more. 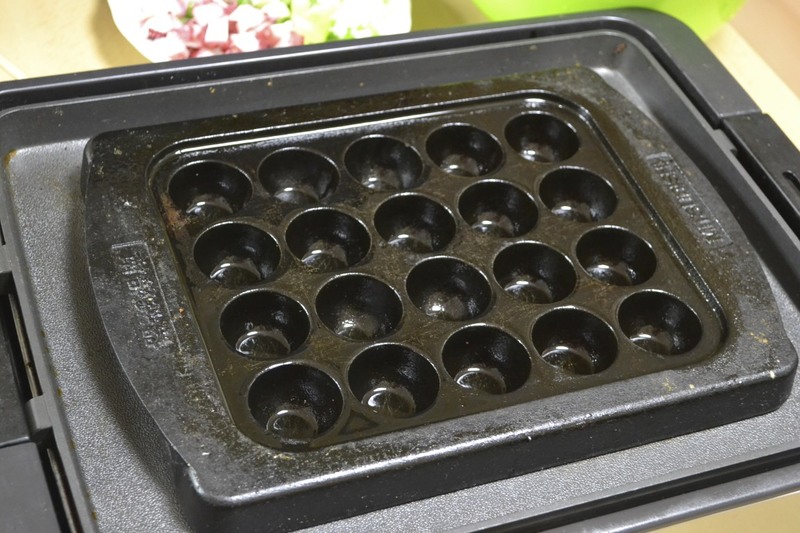 Ensure that all the seeds are very well ground. Add sesame oil, miso paste, dashi-no-moto, sugar and vinegar. Blend until smooth. Add all other ingredients, blend until smooth. Pour into a clean glass jar. Keeps for months if refrigerated. Shake before use. UPDATE 2013.10.25 I now blend in about 1/2 cup Japanese mayonnaise at the end of step 2. It makes the goma dare creamy and more like the commercial brands. Or, if I want to use it as goma dressing, I blend in about 1 cup mayonnaise. 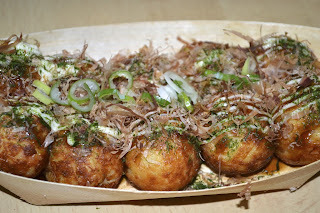 And by the way, I don't even have time for cooking Goma Dare Recipe 2 (below). Easy is good. 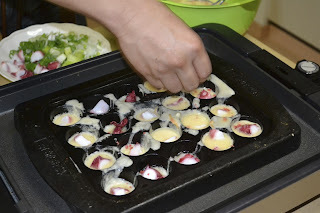 Place water, mirin and katsuo-bushi in a small saucepan and bring to the boil. Simmer 5 min. Strain out the katsuo-bushi and return to the saucepan. Add soy sauce, vinegar, sugar, stirring occasionally as you bring it to the boil. Dissolve akamiso into the liquid. Simmer another 1 min. Set aside to cool. Pour soy sauce mixture from saucepan into the food processor. Process until well combined. Pour into a clean glass jar. Keeps for months if refrigerated. Home-made Goma-dare will separate when stored, so give it a good shake before using. Tenkasu look like rice bubbles cereal but they have nothing to do with puffed rice! 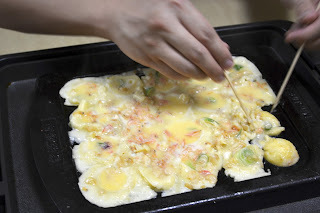 Tenkasu is made by pouring Tempura batter into hot oil. 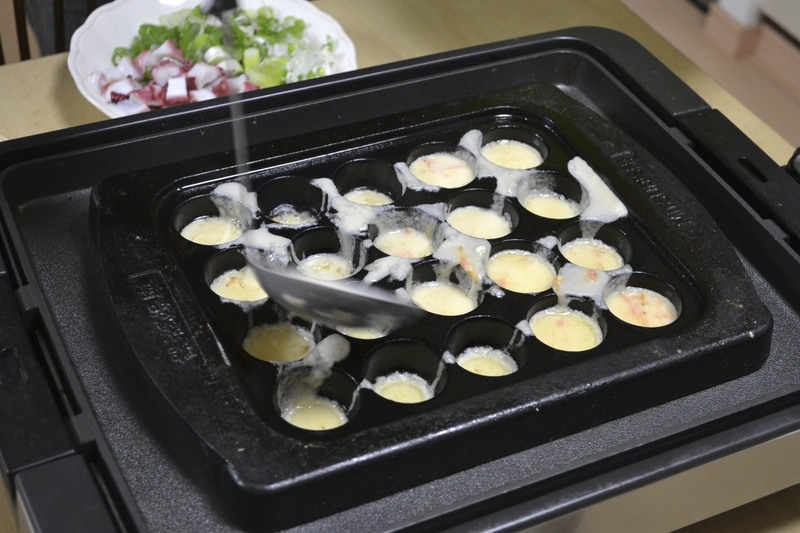 The batter separates into droplets which puff in the oil. It is then scooped off, drained and packaged. Unlike rice bubbles, Tenkasu holds it's shape and stays crisp even when wet. It is added to Takoyaki to add volume which won't shrink as the takoyaki cools. This allows for perfectly round takoyaki. 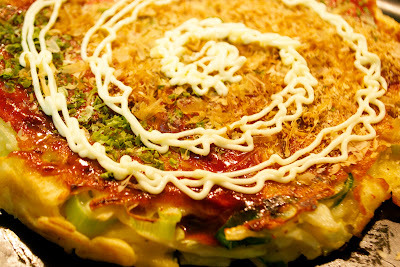 It is sometimes added to Okonomiyaki. Here they're served in a boat I got from Gindaco. 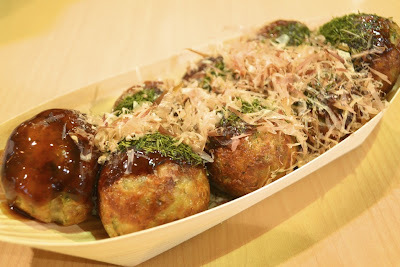 Here is the secret method to get your takoyaki balls crispy, golden and perfectly round, just like Gindaco! The mixture will be like a thin milky soup. 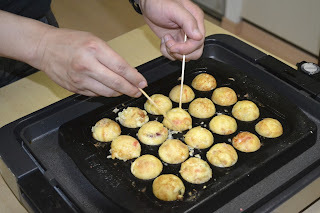 This is part 2 of the Takoyaki Tutorial. 1. Brush hot takoyaki plate all over with oil. 2. Half-fill the holes with batter. 3. 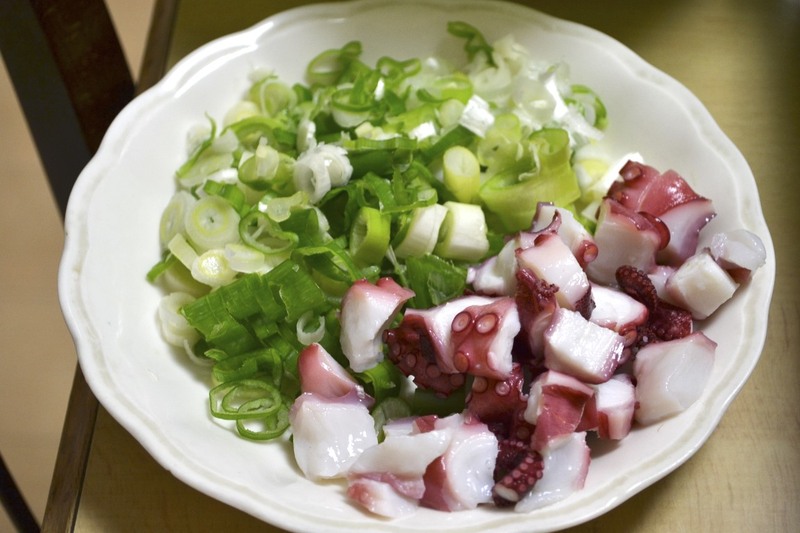 Place a piece of octopus in each. 4. Sprinkle in tenkasu and shallots. 5. Pour batter over until the plate is completely covered. 6. Allow to cook a few minutes. 1. Use picks to divide semi-cooked batter on the plate between the holes. Push batter edges over the hole. 2. Gently turn each takoyaki into a ball by getting the picks between plate and ball and using a lifting-flicking-rolling motion. 3. 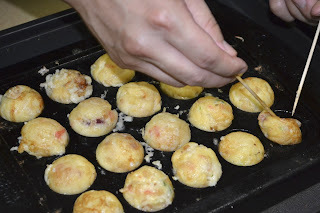 Repeat steps 1-2 for each takoyaki. 4. Go over the plate again incorporating any loose bits into the balls, turning the balls again. 5. 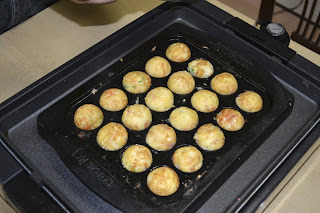 When all your takoyaki are ball-shaped, pour a drizzle of oil onto the hotplate in-between the takoyaki - enough that the oil goes into the holes under the takoyaki. This makes the surface of the takoyaki crispy as they actually fry in the oil. Keep turning balls until they are crispy and golden.